Archive.bat is a simple, self-contained command script to manage essbase archives. It is easily customized for any windows environment and creates a restore command script for simple data recovery. Hyperion Essbase Auto-Processor (HEAP) is a client side automation tool for performing sequences of highly repetitive calculation tasks. It's also a fairly good example of using VBA with the Essbase API. This workbook is a security extraction tool that tracks new and deleted users, provides a visual cross table for users and groups, and generates an easy to read security summary. Some elements can be updated and uploaded back to the server. NOTE: this version supports Essbase version 7 (BSO) only. 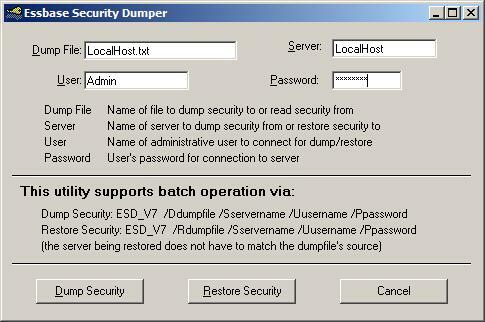 Security Dumper is an excel addin that creates a workbook with a tab for each application and a complete list of users, groups, and filters. This version does not provide an upload (that version is available on a negotiated basis). Note: this version supports Essbase version 7 (BSO) only. ESD is a disaster recovery utility that accepts command line (or User Interface) options and creates (or reads) a human readable text file which can also be used to update security on a server (either intact or after being edited to extract the desired elements). Note: this version supports Essbase version 7 (BSO) only. An updated version has been uploaded which properly reports a filter with Meta Read access rights as "Meta", instead of "Filtered". The old version reported it incorrectly and would ignore the line when restoring security. To use dumps made with the older version, replace "Filtered:" with "Meta:" in the output file (be sure to include the colon).